As usual, it's a "little of this, little of that" kind of week. The biggest news is that instructions for the last step of the Midnight Mystery Quilt came out last Thursday and I finished my quilt top! I'm so excited about this project and glad to have the quilt top done. I have the backing ready to piece and some fun variegated thread. I'm planning all over free motion quilting, but I haven't decided on a design. I'm open to ideas. I also came out of Patchwork City hibernation to get one block done for the massive BOM project. This is Mixed Use. It's 8 1/2" square. This is a 4 1/2" square half size version of the block above. I enjoyed the fussy cutting (one of the reasons I love Patchwork City so much) and had fun squeezing seven different fabrics into this tiny project. I'm also totally digging how that green to green seam in the upper left accidentally came together. I'm unsure how I'll quilt it. You can visit Mary's blog to check out the beautiful line of fabric she has decided to use for the mini mini she's making me. Here's my "secret sewing" project. I showed you my rainbow fabric for my Rainbow Mini Swap Hexie Tiles project last week. At this point, all of the paper piecing is done and I'm working on getting the units all pieced together. I've made a bunch of hexagons. This project is for round two of the Rainbow Mini Swap. I'm done showing peeks on Instagram in the interest of keeping it a surprise for my partner, but I'm super excited with how it's coming together so far. I look forward to sharing the finish with you in March after she's received it. 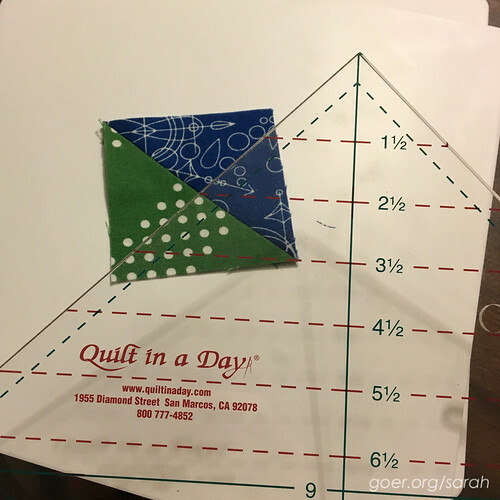 Lastly, I switched gears to a different (secret surprise) project last night and used my new Triangle Square Up Ruler for the first time. Love it! Talk about cutting my trimming time in half! You use this to trim the HST before pressing it open. A big thank you to Christa for sharing about it on a recent Periscope broadcast. Posted in Quilting. 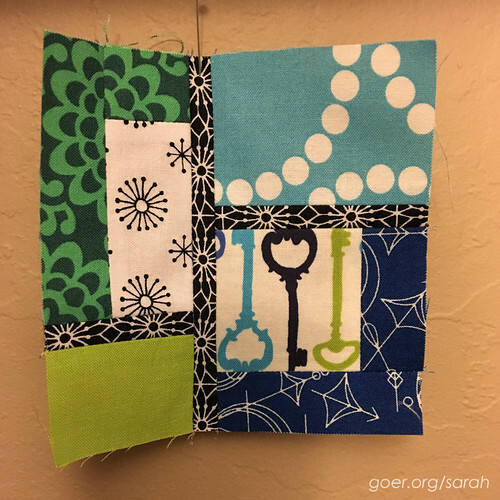 Tags: Midnight Mystery Quilt, Patchwork City, Rainbow Mini Swap Round 2, WIP on January 13, 2016 by sarah. I love it, Sarah! At first I couldn't even tell there was a seam in the upper left green part of the half-sized Mixed Use block. As usual, your color combos are innovative and pleasing to the eye. I'm excited!!! Your Midnight Mystery Quilt top turned out so well. I especially like how the center squares of each block highlight the different fabrics you used but how well they all work together. I think someday I'll be taking a QuiltCon workshop from you on how to more effectively use and combine color in quilts! Oh, you flatter me. I'll have to think about how I make decisions on color and maybe I can run an upcoming blog series on the topic. I'm so glad you like the mini. I'm very pleased with my Midnight Mystery Quilt and I look forward to finishing it. I haven't felt much like working on the quilting step. I think that makes six (nearly seven) quilt tops in the pile at the moment. Eek! A blog series on color by you would be SO terrific!!! I love your mystery top, the scrappy background is perfect!! Thank you, Cheryl. I really love seeing the pattern in everyone else's color ways, especially where people have used a white/neutral in a different place than my grey. Thank you so much for the mystery and I look forward to the next one! Your Midnight Mystery quilt looks fantastic, and it is so fun getting to see everyone's different versions. The final quilt parade is going to be spectacular! 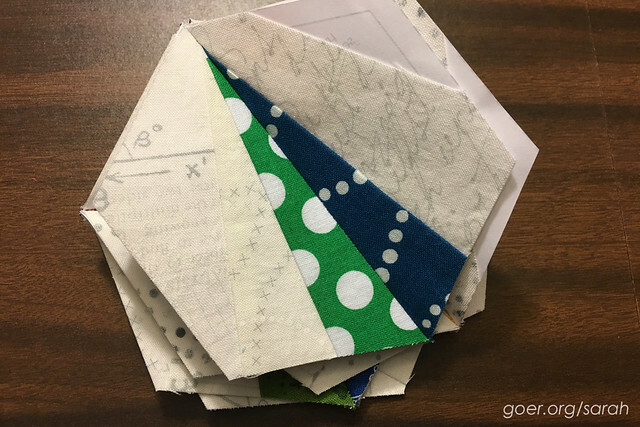 I am excited to see how the rainbow mini comes together for your; I bet you are going to be a Y Seam expert by the time the piecing is complete. I'm gonna have to be! I did use y-seams on a recent project. I didn't master them by any means, but I did get the job done. 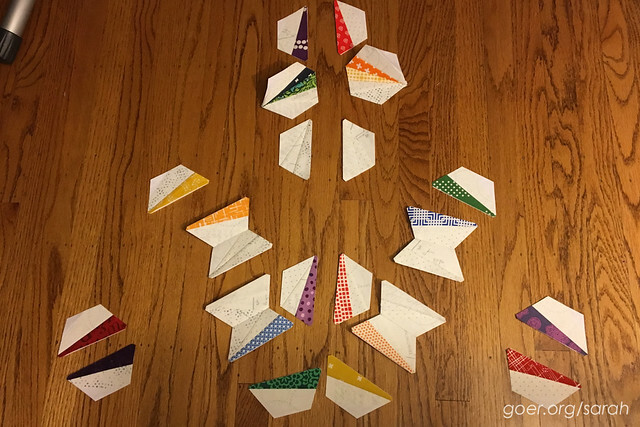 This might be a little trickier with paper piecing paper on both sides. Thanks, Yvonne. I love the Midnight Mystery pattern and have really enjoyed seeing all the different versions. Yours looks great and I look forward to seeing how you quilt it. Your Midnight Mystery Quilt looks awesome! 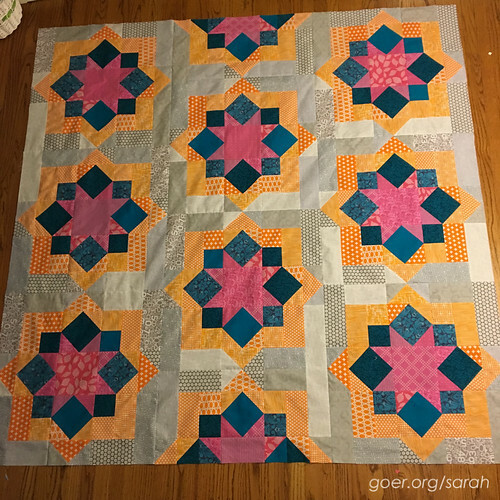 I love the palette of the quilt top! Beautiful! Love the midnight Mystery quilt! And both your BOMs are very eye-catching in their color selection. Well done! Thanks, Robin. The mono chromatic Patchwork City blocks are from the Intrepid Thread BOM, so Julie gets all the credit for fabric selection on that one. :-) I love all the vibrant color! 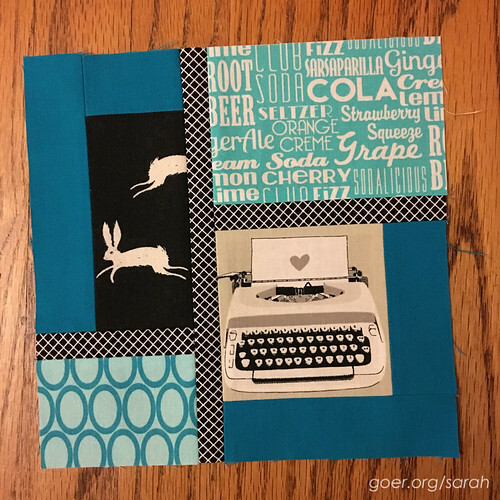 Love your Midnight Mystery Quilt and seeing all the different fabric choices people have used. You have been very busy. It keeps me out of trouble. ;-) I totally agree about all the different fabrics folks have used. The other mystery quilts I've done previously weren't online and I never saw another quilt made with the pattern... so I'm much more excited about the results of this one and getting to see all the different styles. Thanks for visiting, Jennifer. I love your mystery! I just finished mine as well. If you come up with all brilliant ideas on how to quilt it, please share. I haven't got a clue on what colour thread or how to quilt it. I like that ruler!! That's how I trim my HST's but didn't know there was a ruler. I just hopped over to your blog. Yours looks great! I think since mine is scrappy I'll just pick something to do all over quilting... I think the scrappy makes it busy enough that it doesn't need detailed quilting. I think yours could certainly be done with some fun block specific quilting! I've used the iPad app Concepts to take a photo of a quilt block and draw practice quilting on it. Or you could get a sheet of plastic/glass/plexiglass to actually lay over your quilt block to try out some designs. Yellow thread might be a fun contrast to all your colors. Or dark grey. I look forward to seeing what you decide on. I've only seen a couple people who have started quilting theirs in the FB group. I'm looking forward to seeing what others do. I'm intrigued by your secret sewing. I'm getting more and more excited about it as it comes together. I'm not usually this far ahead of the deadline with my sewing. (Shipping is in early March.) It will be hard for me to not show it off as soon as it's done. :-) Thanks for visiting, Lisa. Your combination of fabrics is just awesome! Your Midnight Mystery quilt just sparkles with so much interest! And your Patchwork City blocks are so much fun!! They are going to make for a really fun and happy quilt! What fun projects. Good job on your quilt top.